Belgium’s three regions (Brussels, Flanders, and Wallonia) independently publish the statistics for their region. We have collated the results (1-3) into a single table covering all of Belgium. 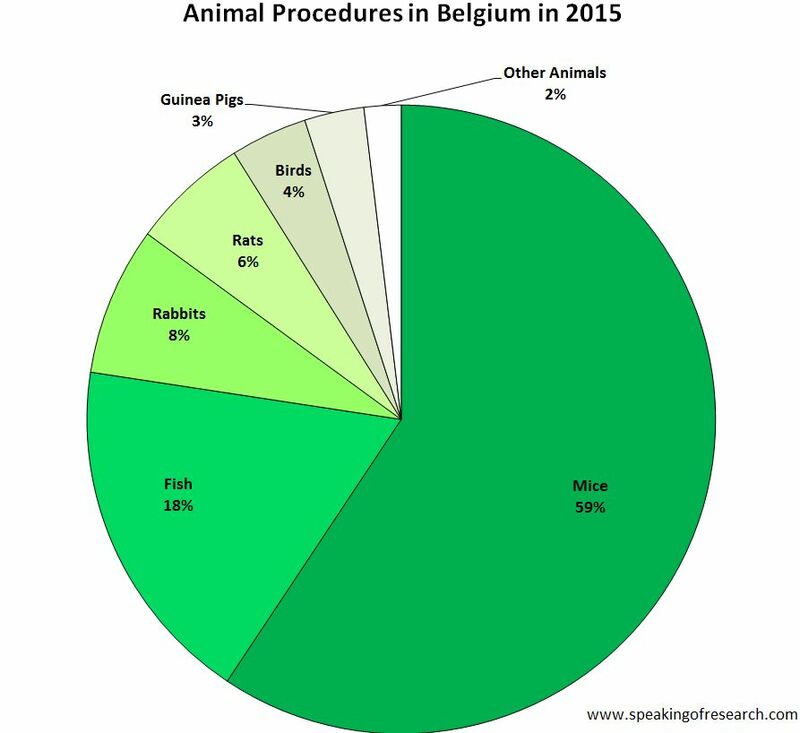 There were 566,603 procedures in Belgium in 2015, down almost 15% from the previous year. 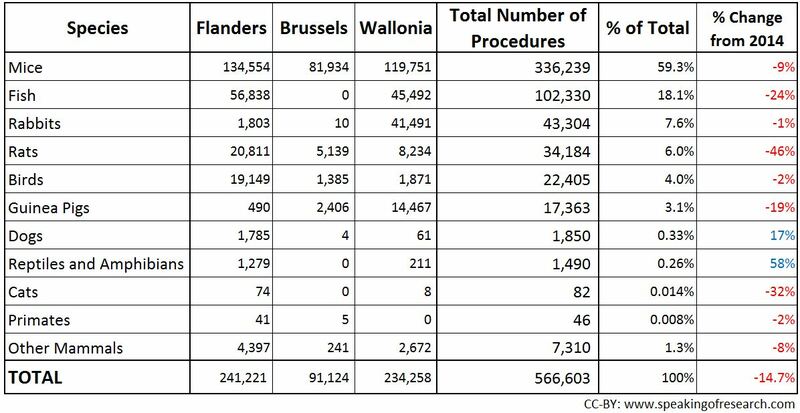 The numbers fell in all three regions of Belgium, with the number of procedures in Flanders falling 14%, Brussels falling 7% and Wallonia falling 18%. By species, the biggest falls were in fish (down 24%), rats (down 46%) and guinea pigs (down 19%). This all follows a general downward trend in numbers over the past two decades. 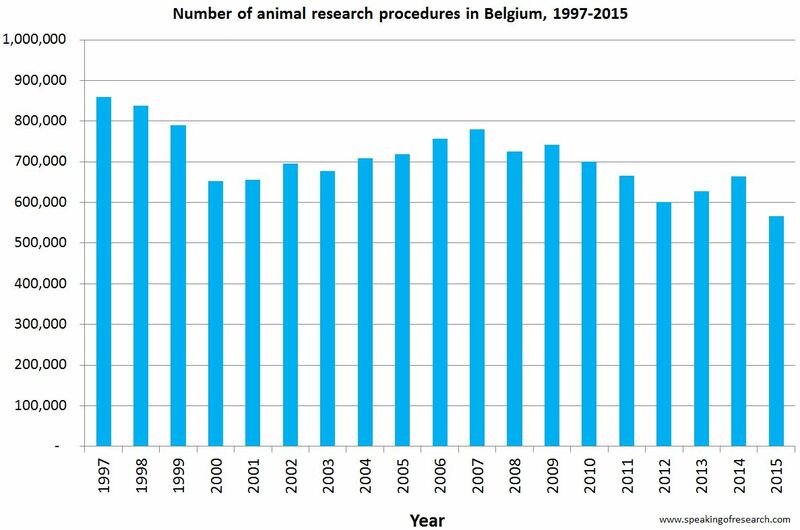 Trends in Belgian animal experiments 1997-2015. Unusually for a European country, rabbits were used more than rats in 2015 (not true in 2014). Mice, rats, fish and birds still accounted for 87% of research, rising to 85% when rabbits were included. Greece published its 2015 statistics recently (5). 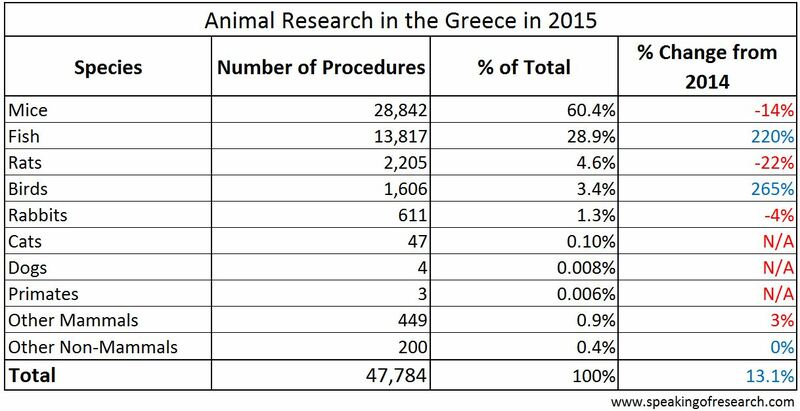 There were 47,784 procedures on animals in Greece in 2015, a rise of 13% (5,541 procedures) from the previous year. 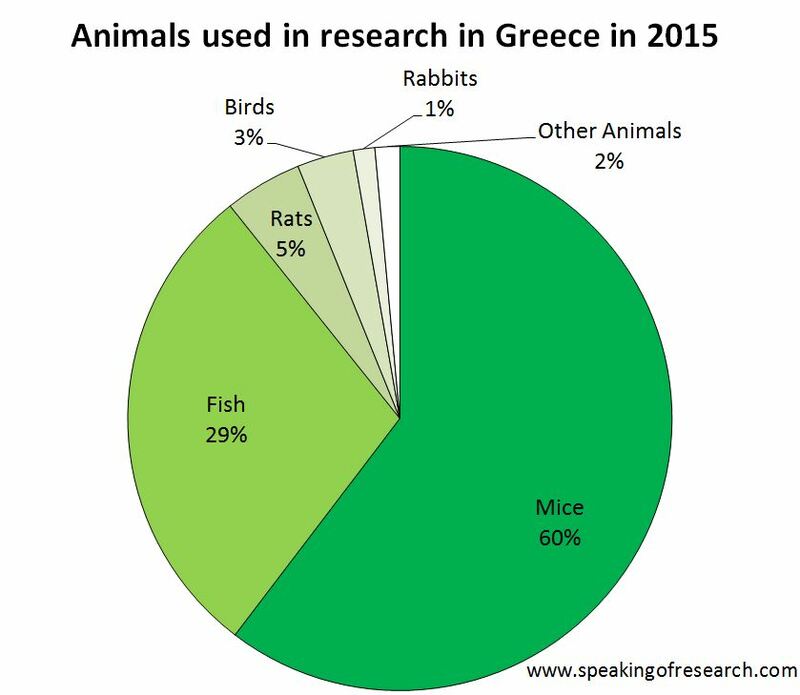 Over 97% were mice, fish, rats and birds (mainly mice and fish). The number of fish more than tripled to 13,817 procedures. Unlike the previous year, there were procedures on cats (47), dogs (4) and primates (3). These species account for less than 0.15% of animals used. The severity statistics show that 70% were classed as non-recovery or mild. 6.5% were classified as severe. After the publication of the 2014 statistics we had to make an editor’s note because we spotted some unusual trends. It turned out that Poland had erroneously added over 400,000 fish to their statistics. We have concerns about the 2015 data which is why we have not written it up in full. 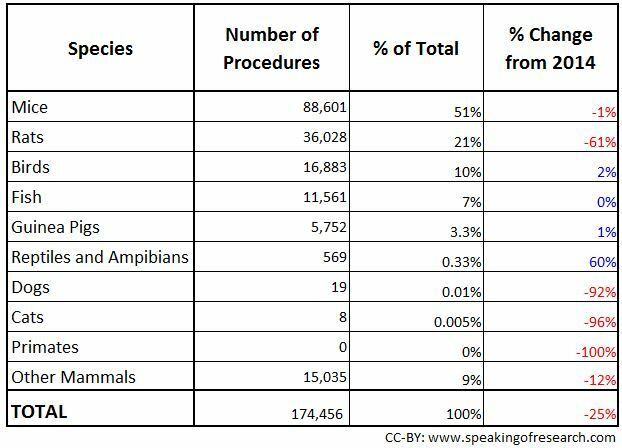 The 2015 statistics show that there were 174,456 procedures on animals in 2015. This is a 25% fall compared with the previous year (6). This data may be incorrect. See text below. Our concerns are twofold. Firstly, the number of procedures on fish – 11,561 – is exactly the same as the data for 2014. This seems exceptionally unlikely. Secondly, there appears to be a discrepancy between numbers of animal procedures in the severity tables for 2015, and the numbers in the basic data. For example, the severity tables show 88,776 procedures on mice. The general data for 2015 shows 88,601 procedures. For these reasons, we recommend caution when using this data. Speaking of Research will continue to try and get to the bottom of this data (as we did for the 2014 statistics). Previous Previous post: Help us help you!